Golf's generational shift gathered unstoppable momentum in 2015 as Jordan Spieth, Jason Day and Rory McIlroy became the dominant stars at the top of the men's game. This youthful trio pushed the sport into a new era and established stars faded from prominence, with Tiger Woods and Phil Mickelson leading the retreat of the older order. It proved one of the most compelling periods in recent times and there was plenty that made 2015 memorable and significant. Augusta is the place where the season always comes alive and this year's Masters proved the perfect template. Set up for low scoring, Spieth took full advantage and matched Woods' record 18-under-par total to land his maiden major with a four-stroke victory. This was the year when broomhandle putters were being jettisoned in preparation for the ban on anchored putting, which comes into force on New Year's Day. Among those most affected is 2013 Masters champion Adam Scott. The 35-year-old Australian's move to a conventional short stick coincided in a fall from three to 12 in the world rankings. Nevertheless, Scott contributed to the most enthralling of the year's majors - the US Open staged at Chambers Bay for the first time. Scott charged into contention with a closing 64 as Gary Player blasted the new venue saying it was "the most unpleasant golf tournament I've seen in my life". The greens were awful - Henrik Stenson said it was like putting on broccoli - but on a stunning final day, Spieth's birdie at the last gave him back-to-back majors. While the young Texan sensationally remained on course for a Grand Slam, the real star of that US Open was Jason Day. Flattened by vertigo at the end of his second round, he bravely battled to a share of the 54-hole lead. Although the Australian ran out of steam, he challenged for The Open at St Andrews, won the Canadian Open the following week and secured a record-breaking first major with a 20 under par victory at the US PGA Championship in Wisconsin. There were plenty of sideshows, among them the US election campaign. Republican frontrunner Donald Trump's outspoken comments on Mexican immigrants and Muslims were problematic for golf, which is distancing itself from its highest profile course owner. Already the PGA Tour is considering moving the 2017 WGC from the presidential candidate's Doral property, while the R&A considers whether to keep Trump Turnberry on the Open rota. The European Tour seems to be ditching plans to take the Scottish Open to Trump's place near Aberdeen, and also got into a lather over the status of its PGA Championship at Wentworth. Marketed as the tour's flagship event, new chief executive Keith Pelley stunned observers by stating it could no longer be regarded as such because of the £3.7m tournament's relatively small prize fund. A bigger controversy was the 'Gimmegate' row at the Solheim Cup. US rookie Alison Lee erroneously picked up her ball thinking a tiddler on the 17th had been conceded by the European pair of Suzann Pettersen and Charley Hull. Pettersen was vilified for a lack of sportsmanship and although the home pairing won a point from that fourball contest, they lost the moral high ground. The visitors were galvanised by the unsavoury incident and surged back from 10-6 down to regain the trophy in thrilling fashion. Hull, though, emerged from the row with her reputation intact, and it was a steady year of consolidation for the British number one. Still only 19, Hull ended the year 41st in the women's world rankings. So who are the 'king' and 'queen' of golf? Back in the men's game, Italy caused a major shock by landing the rights to stage the 2022 Ryder Cup thanks to an 11-year commitment to elevate the Italian Open prize fund to 7m euros (£5.13m). Justin Rose can reflect on 2015 with much satisfaction. The Englishman was a combined 34 under par for the four majors, the fourth best tally in the history of the men's game. Rose won titles in New Orleans and Hong Kong and his consistency after a lacklustre start to the year kept him firmly ensconced in the world's top 10. He may well have claimed a second major but for the exploits of Spieth, the undoubted king of golf in 2015. Rose was joint runner-up to him at the Masters. 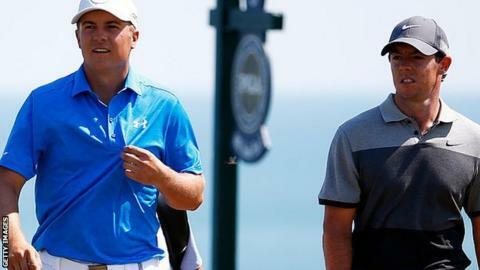 Spieth claimed five victories including the first two majors before coming up a shot shy of making the play-off for The Open and finishing runner-up to Day at the US PGA. He is a most worthy world number one. Davis Love will undoubtedly make Spieth a focal point in his US Ryder Cup team next year. Last February the 51-year-old was the surprise choice to return to the captaincy after leading the US to defeat at Medinah in 2012. Martin Slumbers was another appointment in 2015. The successor to Peter Dawson as R&A chief executive shows no signs of sleeping on the job, having energetically embraced his role as one of the most powerful men in the game. Golf's nearly man remains Dustin Johnson. The big-hitting American three-putted the last at the US Open to lose to Spieth by a single shot, and led at the Open and US PGA but failed to secure a first major title. The Olympic countdown continues and while Scott has made known his antipathy towards Rio 2016 and McIlroy was lukewarm in his latest comments, the Games will be a big part of the golf narrative next year. So too Pelley, the European Tour's vibrant new boss. In his first three months in charge he achieved gold card airline status as he set about a globe-trotting shake-up of the Wentworth-based circuit. If Spieth is the king of the game, Lydia Ko should be crowned queen. In February she went to number one in the world, three months before her 18th birthday and in late summer the New Zealander landed her first major at the Evian Championship. The men's Race to Dubai came to a thrilling climax with Danny Willett pushing McIlroy all the way. The Northern Ireland player was granted a special dispensation to play only 12 events as Pelley put commercial imperatives before sporting integrity, a move that drew little criticism. St Andrews staged a memorable five-day Open as most of the Saturday was lost to high winds. It was the only course in Fife to be shut that day. Have Open green speeds been made too fast for the prevailing conditions? Tiger Woods failed to make the cut at the Old Course, one of three early major exits in a disheartening year that ended with two back surgeries. He says he wants to be playing at next year's Ryder Cup but that looks a forlorn hope. Merely returning to playing regularly would be a triumph. Among the year's unlikely heroes was the American-based Scot Russell Knox who was the last reserve into the WGC Champions tournament in Shanghai. He emerged victorious, joined the European Tour and harbours hopes of a Ryder Cup debut next year. While Paul Casey's decision to ditch the European Tour was vindicated by his climb from 75 to 22 in the world, it is hard to fathom why he continues to stay away. The Englishman could make himself eligible with just four appearances (if he played the French Open) and the Ryder Cup and Olympics would also count in that tally. Whistling Straits, in the middle of nowhere in Wisconsin, staged the US PGA and is slated to hold the 2020 Ryder Cup. It is a fine course for matchplay but its remoteness makes it an awful location for the biggest show in golf. McIlroy made it to that PGA despite the X-rays that showed a ruptured ankle ligament from his footballing accident in July. The injury cost him his Open defence and ripped the heart out an ultimately frustrating year. Expect the Northern Ireland star to ditch his footy boots and to have a huge season in 2016. He will need it too - this is now a game for a burgeoning younger generation. Great strides were made by the likes of Matthew Fitzpatrick (21), Byeong Hun An (24), Justin Thomas (22) and Thomas Pieters (23). Remember Spieth is also still only 22. But there is still room for the older guard. Well done to Zach Johnson for proving St Andrews isn't just the preserve of the game's biggest hitters by beating Louis Oosthuizen and Marc Leishman in a play-off to lift the Claret Jug. Read more on Golf in 2015: Rory McIlroy career Slam? Tiger Woods comeback?